Available from Austrian dealer Satforce, the Eycos hails from the same factory that makes the PVR5020 for Echostar. The similarity goes more than skin deep as the software is very similar. A plus point for the S50.12PVR is that it comes with two remote controls. One has myriad setup and function buttons; a smaller, simpler handset is for 'everyday' use. The S50.12PVR's two tuners can be used with different satellites, twin-output LNBs or even a single LNB feed looped through to the second tuner. Both tuner inputs support DiSEqC 1.0/1.1 switching and DiSEqC 1.2/USALS motor control. Once this is set up, everything else is automatic, including the satellite scanning (done just once to fi ll the 8,000-channel memory, and fast at three minutes to scan Astra 1). The PVR facilities are good - the S50.12PVR can record up to four channels (from the two tuners) and display two more (full-screen and PIP). You can pause and rewind live broadcasts (the P1 buff ers an hour's worth after a channel change) but you cannot convert save a paused programme. Playback speeds can reach 16x forwards and 8x backwards, but there's no way to jump to a particular point in a recording. The S50.12PVR also doesn't allow a recording to be watched before it's complete. Encrypted broadcasts can be decoded, either as they record or later, and recordings can be edited or split up. 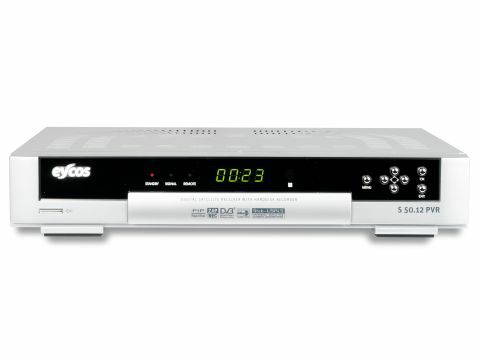 As Echostar is pulling out of the domestic satellite receiver market in the UK, it's good to know that Eycos offers similar models. Indeed, the S50.12PVR is not the flagship receiver for Eycos that the PVR5020 is for Echostar, and the S70.12PVR has now been launched with a few more eye-catching features. The S50.12PVR is a worthy contender but, like the Echostar, it is overpriced.